Overall, as full-frame all-rounders go the 5D Mark IV is hard to beat. It’s a deft balance between resolution, autofocus ability and control, seeing it stand head and shoulders above its predecessor and, right now, the competition too. Even in the wake of the top-end 1D X II, the 5D still makes enough waves to be in contention for camera of the year. Canon has stepped things up a gear in recent years by leading with higher-resolution DSLR cameras. It had long been said that the 24-megapixel mark would be the company's limit until lenses could make the best of the capture resolution - a concept that was not just slightly but entirely demolished by the company's 50.6-megapixel EOS 5DS (and R) DSLRs. Enter the brand new Canon EOS 5D Mark IV and that resolution trait has, in part, influenced its choice of sensor. For the 5D Mark IV dons an all-new 30-megapixel full-framer, making it a notable step-up over the previous Mark III's 22.3-megapixel offering, which, at the time, was perceived as a limited jump over to the Mark II model. The EOS 5D range has long been known as the enthusiast DSLR - but never as a Nikon D810 competitor, which is approaching where the 5D Mark IV is now pitched. What it offers above and beyond its near competition, however, is staggering performance across the board. Is the 5D IV the ultimate do-it-all full-frame DSLR of choice? Canon EOS 5D Mark IV review: What's new? It's not just the sensor that's new, though, with the 5D Mk IV embodying a number of other upgrades over 2012's Mk III model. Here's the skinny: there's touchscreen control, Dual Pixel AF for better live preview and video focusing, 4K video capture, seven frames per second (7fps) burst shooting at full resolution, and a 61-point autofocus system - the last which is more-or-less ripped from the top-end EOS 1DX II. Oh, and there's also built-in GPS for geo-tagging images within camera. The first thing that we'll come to is the touchscreen; a feature we didn't use much at first but, over time, have got into the habit of using. It's Canon's most thorough touchscreen to date, surpassing that even of the top-end 1D X II because you can thumb through the menus with fingers, select options, swipe through images and even pinch-to-enlarge - which is something you probably do all the time on your smartphone. Sadly, though, the screen isn't mounted on a tilt-angle bracket. We can't say we had anticipated one, but with competitors such as the Pentax K-1 showcasing a fully adjustable screen, we would like to see the majors follow suit. And as we use a Panasonic GH4 most days as our go-to work camera, we've really missed this feature for floor-level work, or just when positioning the camera body lower than we otherwise would. In terms of resolution this 3.2-inch panel benefits from a 1,620k-dot density - another jump ahead compared to the 1,044k-dot panel in the earlier Mk III model. It's tricky to truly notice, given how low-resolution DSLR screens are compared to phones and other devices. As a “dot” is comprised of three colours (RGB), its true pixel count is a third of the quoted dots - so here it's around 500k-pixels, which amounts to roughly half that of 720p (a bit more than an old SVGA monitor). Still, it's higher resolution than most of its competitors, so is a positive in the order of things. Joining the screen is a built-in 0.71x magnification viewfinder with a what-you-see-is-what-you-get 100 per cent field of view. It's large to the eye, which is great, but it's the LCD overlay within that's most handy. This overlay shows off the active autofocus point grid, with the in-focus point illuminating red when in low-light conditions. It's possible to add an auto level and grid too, if you want. There are even options to display warnings to the side of the finder for things like when white balance has been adjusted on camera - just in case you forget to switch back. Now, the autofocus system in the 5D Mk IV isn't precisely the same as the 1D X II, as it has a lower resolution metering sensor and, therefore, cannot as accurately predict tracking movement. But that's the only real difference, otherwise the full-on 61-point array is still accessible and just as customisable. All the same scenarios built into the camera too - there are six Cases to cater for varying tracking sensitivity, subject speed/direction and AF point auto-switching - so you can adjust how the 5D will respond to subjects moving through the frame, towards or away from the camera, and how quickly new subjects within a given field will affect focus adjustment. In terms of sensitivity the 5D IV is just as high-end as the 1DX II, with 41-points cross-type designated for equal sensitivity in both portrait and landscape orientation. A full 20 of those points remain sensitive to f/4.0, which is useful when using a tele-extender and limited aperture selection. Even five of them are dual-cross for heightened sensitivity across the axes, not just portrait or landscape. We've not been out and about shooting motocross or anything during our test period with this camera, just the occasional carp splashing about in a pond (they move pretty quick when there's food involved) or train passing through a crossing. Each and every time the 5D IV seems spot on with tracking; it's down to you to select the correct settings, in particular shutter speed, for such scenarios and how much off-point blur you're looking to achieve. Given the rise in resolution, the 5D MkIV's 7fps burst mode is impressive, trumping the previous MkIII model by one frame per second. With JPEG and raw shooting activated the buffer maxes out at 21 consecutive images captured - which is about 50 per cent greater than what you'd get from the previous 5D (it's a lot more data considering the bump in resolution). The 5D IV isn't just set up for use through its viewfinder; DSLRs are evolving. As the new sensor sports what's known as Dual Pixel AF there's a second layer of pixels on its surface, the data from which is used to offset against the standard focus data to deliver faster and more precise focusing in live preview. In short it's Canon's fastest screen-based autofocus available right now. Actually, it's the fastest we've used in any DSLR camera (not faster than all compact system cameras, though, but not miles behind). Or flick the switch on the rear of the camera to place the 5D IV into its video mode, which responds just like the live view mode with the ability to capture up to 4K resolution at 24/25/30fps (a 1.7x crop/magnification applies, so keep that in mind when thinking about your lenses: a 100mm macro would equate to a 170mm equivalent for 4K capture). However, 4K is only available in the Motion-JPEG (M-JPEG) format, which is like a series of 8-megapixel stills - a decision we think is purposeful to keep the company's top-end cameras (C-range video-focused cameras and the like) at an arm's length from one another. For 1080p capture the full 24/25/30/50/60fps rates are available in ALL-I and IPB compression, or via a clean HDMI out to capture. This, realistically, is the mode to work with if you're looking for the highest possible amount of information at capture. But back to these two layers of pixels for a moment. Canon has done something very clever with what they can do - and it's called Dual Pixel RAW (DPRS). Think of it like a double-layered raw file, with two layers of information that means focus can be micro-adjusted in post-production to get the crispest, most in-focus shot possible. You'll need to enable Dual Pixel RAW from within the settings (it's either on or off), which makes those raw files roughly double the size of a normal one. For some, however, DPRS and the added size on card will be well worth it. Now don't go thinking the new 5D is like a Lytro light-field camera, because it's not - it can only make marginal adjustments, but such adjustments in post might be the difference between a good shot and a great one. We were in a Canon session and saw a shot of a tape-measure, placed at 45-degrees, that could adjust around 2cms of focus depth via this method (at a 135mm focal length, that equates to around 1cm front-to-back). It's a small adjustment, sure, but let's say you're a portrait pro and the camera has focused on an eyelash rather than an eye - this feature means you can adjust for that. The only problem (if it can be called that) with DPRS is that you'll have to use Canon's own software, Digital Photo Professional, which is clunky and slow to use in our prior experience. We're just too used to Photoshop (which, at the time of writing, isn't compatible with the 5D IV's CR2 raw files, but will be later down the line - so long as you have the very latest version of the Adobe software). 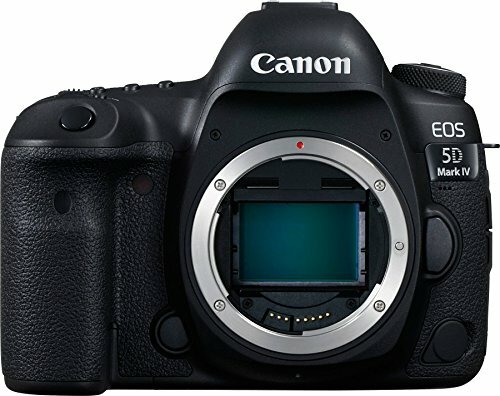 Most DSLR cameras don't intend to reinvent the wheel, with the 5D Mark IV adopting the familiar makeup of the EOS series. It looks very similar to the 5D III before it. There is one entirely new control, though: an "AF Area selection button". This little nub, positioned offset just beneath the rear joystick control, can be used to make quick adjustments between the given AF Area. So if you want to change between 61-points to a square of 9-points, for example, first tap the focus area button, then hit this selection button to cycle through the options. It can be used to auto-centre the focus point too, with a second press reverting back to the previous selection should you have the need to toggle between two commonly used areas within the frame. It's a highly effective new feature. Otherwise we can't really criticise the 5D IV's layout. The only addition that springs to mind, having used the camera pre-sunrise in downtown Seattle, is that the lack of back-lit or glow-in-the-dark buttons - as found on something like the Nikon D500 - can make low-light conditions less than ideal. There is an illuminating top panel, though. Card slots consist of one SD and one CF. There's no C-FAST, XQD or other options available for this 5D - presumably because there's no need given the 4K M-JPEG cap and overall buffer/burst rate. Still, 30MP files are large - as our MacBook Air has found after opening dozens of the files in one go. There's also Wi-Fi and NFC for contact-based connections, to sync with the Canon Camera app to share images and/or control the camera. The big kahuna: image quality. And we've been fairly blown away by the 5D Mk IV's capabilities across the board. From low-light scenarios, to mixed lighting, indoors and out, through to bright sunlight - it's clever enough to judge exposure and colour well, without losing clarity or being overrun with image noise. Fortunately, the 5D Mark IV knows how to handle itself when it comes to image processing. It's got dual processors on board - a Digic 6 and Digic 6+ (no Digic 7 like the EOS M5) - to crunch through those pixels and maintain sharpness while reducing the presence of image noise. Sensitivity ranges from ISO 100 - 32,000 (expandable to 102,400), which is plenty of scope to shoot in all kinds of conditions handheld. Colour noise is absent to ISO 800, whereafter the subtlest amounts can be caught in the mid-grey areas - as witnessed in the panels behind our model elephant shot, for example. Because Canon utilises a selective noise reduction process, such presence can only be spotted in certain areas - in an ISO 2500 shot of an oscilloscope, for example, the presence is negligible to none. At the other end of the spectrum - although, generally speaking, we've rarely shot at ISO 100, adamant as we have been to maintain that high shutter speed rule - and there's bags of colour and detail on display. Be it the differentiation of bricks in a building, or the textured side of a macaron (Le Panier's "Passion" in Seattle a particular favourite and worth its $2 cover price, thanks) there's plenty of bite in the JPEG files. Go raw and you'll get an even deeper ability - although, at the time of writing, these particular CR2 raw files can't be opened in Photoshop. On balance, if you're going to be shooting ultra-low-light handheld, such as at gigs, then a lower resolution camera, such as the higher-positioned (and pricier) 1D X II, is probably better placed. Same goes for sports photography. What the 5D IV is aiming at is the be the best all-rounder that it can be - a goal at which it ultimately succeeds with image quality to match. It's been four years since the 5D Mk III hit the market, so has the Mark IV version been worth the wait? Absolutely. That bump in resolution to 30-megapixels won't suit all, though, while the £3,630 body-only price tag is a whole lot of cash. But there's not a great deal missing for this level: we'd only like to see a tilt- or vari-angle LCD screen to the rear, some light-up buttons for working in the dark and a further push in 4K video capture to appeal to a wider audience. The 5D IV is a deft balance between resolution, image quality, autofocus ability and control, seeing it stand head and shoulders above its predecessor and, right now, the competition too. With Nikon's current absence in the market, perhaps only the near-priced Sony A99 II would be an alternative option - but probably not if you're already invested into the far-reaching set of excellent Canon optics. And there's not a mirrorless model to compete at this level just yet, even if Fujifilm if knocking on the door with its X-T2. Overall, as full-frame all-rounders go the 5D Mark IV is hard to beat. Even in the wake of the top-end 1D X II, the 5D makes waves big enough to be in contention for camera of the year.